At the turn of the twentieth century, childbirth in America took place almost exclusively in the home. The first maternity wards were connected with teaching hospitals, and only poor mothers gave birth in them. Physicians soon realized the value of all pregnant women as “teaching material,” and they began a crusade to end home births. The doctors’ campaign succeeded. By 1920, hospital birth was the new norm, and the standard of care included anesthetizing all laboring mothers. These drugged mothers were unable to care for their newborns, and so babies became secondary patients. Approximately 80% of mothers had hospital births by the end of WWII, and hospitals had to build large nurseries to house infants for the now mandatory post-birth observation period. Babies were further isolated by strict medical procedures put in place to keep the newborns safe from the infections that are ever-present in a hospital environment. With the advanced technology and ease of access to modern medicine available to pregnant women in the United States, it would be easy to imagine that childbirth has become safer for mothers and babies. That is not the case. Without going into a discourse on every possible intervention practiced in medicalized childbirth, I’d like to briefly visit a few of the more common practices and list some of the reasons Tom and I decided to avoid them (I realize that emergencies do happen in a minority of cases, making interventions necessary). Regardless of where you give birth, your provider will check the baby’s heartbeat intermittently throughout labor and delivery to ensure the baby is not under too much stress. This can be done in several ways: with a stethoscope; a Doppler (a handheld device with a speaker); electronic fetal monitoring (“EFM”) (an electronic ultrasound device strapped onto the mother’s stomach); an internal monitor; or with telemetry monitoring (like EFM, but mother can remain mobile).13 EFM has become a routine part of any hospital birth, regardless of whether the mother/baby are high or low risk. 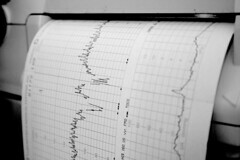 Unfortunately, continuous monitoring of the fetal heartbeat may have negative consequences. If you do not wish to be monitored continuously during labor, talk to your midwife or OB. Let her know that you would like to be monitored intermittently or even with Doppler. Show her the research that continuous (and admission) EFM increases the risk of further medical interventions.